Peel bananas; cut each in half crosswise. With knife, gently spread peanut butter over each banana half. Press gently into cereal crumbs to coat. Gently press stick into bottom of each banana half. Eat immediately and enjoy! When choosing bananas for this snack, go for the ones that are ever so slightly still green at the tips. Their firm texture is perfect for these cereal pops! 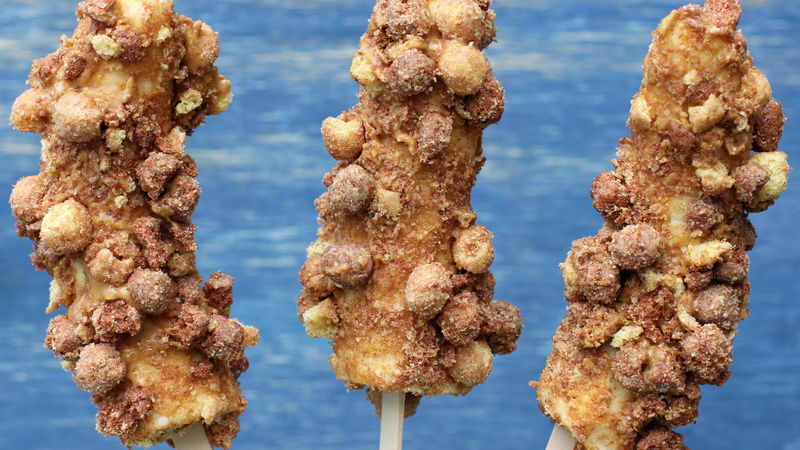 Try making these simple cereal pops with your favorite Big G Cereals! Cinnamon Toast Crunch® cereal will add a sweet, cinnamony flavor to them, while Wheaties® cereal will lend that extra crunch! Try freezing your banana pops for a chilled snack that is available anytime you want some peanut buttery goodness!